In this Monday morning episode of Speak Up on Kotaku, commenter Cobaltios tells the story of how he drifted away from PC gaming, only to have Valve's downloadable PC game service drag him right back in. I actually debuted my gaming experience on the PC with DOS games, and for the most part, had always rather enjoyed playing games on the PC. Some of my favorite games were on the PC; SimCity, Roller Coaster Tycoon, MechWarrior, StarCraft (later on), Muppet Treasure Island (point and click adventure game that I thought was good) and a few other games that I've forgotten but were still definitely part of my gaming time. However, at the time, installing a game and getting them to work was hella tricky. There would be settings that would prevent a game from working, components that needed to be upgraded for them to work... it was annoying. Once I got into video game consoles, I started to go with that path and stick with it since it was far simpler to play video games on. Sure, I'd stick with consoles for the most and play some PC games on the side, but I wasn't playing as many games on the PC as I'd used to. Eventually, I decided to completely stick with consoles for my gaming needs. I thought it was a good decision; games were cheap enough if you knew where to look, extra controllers were easy enough to find, and getting the game to work was relatively a simple matter. So, I pretty much just switched sides. Then, sometime a little into 2007, during my last year of high school, I was introduced to the Half Life series (I had actually heard about it before, but was a bit apprehensive about it at first). Didn't give it much thought, but hey, okay cool. Then the whole buzz about Portal hit, so I checked out a few videos. My god, I had to play this! Only one problem, it was for 360/PS3/PC... but I didn't have either of the HD consoles... and I seriously doubted my PC could run it, but I decided to go through with it anyways. At this time, I had just moved to a new location (used to live in Alberta, now I live in Ontario) and therefore didn't have a job. So, yes, I pirated Portal. Granted, after actually giving the "burnt" copy a try, the game would crash after attempting to go through the first portal. Found out the "crash" was due to hardware being inadequate :P.
Somewhat discouraged, I came across something that essentially acted as a "free" version of Steam; PacCafe/Steam. 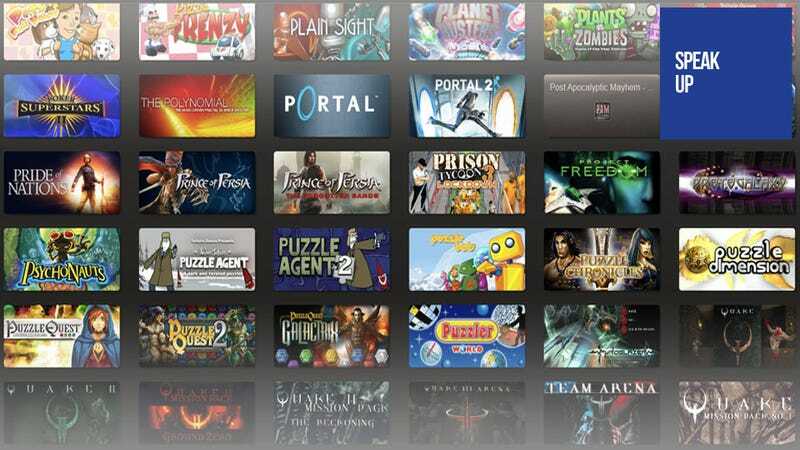 It was designed to enable people to get certain games off of Steam for free. Lacking any means of actual funds, I gave it try, and decided to go with Half Life 2. Having already watched a walkthrough of the game, I knew what I had to expect and therefore was looking forward to it. My PC could just barely run it. Slow, chugged, lagged, but still relatively playable. I eventually had a period where I sort of decided to ignore PC gaming for a while, and headed back to my other 2 consoles at the time, Wii and PS2. However, after acquiring a better video card, and some extra RAM for my computer (CPU was still a bit "old", but still relatively functional at the time), I was then able to finally play Half Life 2 properly. I eventually tested it with Portal, and although a tad sluggish as well, it was still actually playable. I later bought both Portal and Half Life 2/Episode1/2 later on, but was still unable to use Steam properly due to lack of means to actually pay for things (didn't own a credit card). I was still pro console gamer... up until a point in 2010. That was when I was in college, and I needed to pay for some food, but I had yet to receive my student loan. What did I do? I activated my credit card... and soon after, I would discover how to use it to pay for online games. Hoo boy... started it with Knights of the Old Republic, after a classmate informed me of Steam having a $5 deal on it. I later bought Minecraft, which would essentially be my undoing. Minecraft would be my slow convergence into the PC gaming side... but it wasn't done yet. I later found out about the Left 4 Dead deal involving buying both games, plus the special event DLC... all for $10. You could imagine my surprise when I did this; after having bought console games for more than that for a single game, having all that... for $10, was a surprise in itself. Team Fortress 2 was next, being sold for $10 as well. At this point, PC gaming for me was gradually picking up. The games that originally brought me back to PC gaming would also be acquired for the Xbox 360. Then the Black Friday Steam sales hit last year. Man did I buy a lot of stuff. Some of it were indie packs, others were games I had initially pirated, but decided that for such a low price, I'm buying it! When I finally did upgrade my PC proper (better CPU and motherboard), playing some of the more... troublesome games were a snap! Minecraft, being the bigger one, worked flawlessly (almost), and playing other games wasn't so bad. I eventually started playing more and more PC games. Many of them I had initially wanted for console, but the prices really appealed to me. Things took an immense change just recently after both this year's summer sale, and me purchasing a PS2 to PC adapter; allowing me to use a PS2 controller to play my games with. Or at least those that could be optimized with one. Now? My computer still can't quite play the vast majority of the games I've recently purchased, but now that I know of the components I need to upgrade in order to make them work, it's not so bad. Installing them is easier than ever, and even if they don't work the first time, patches, user feedback and the general community is there to make sure getting to play these games is incredibly easy. Verdict: I haven't entirely reconverted, but let's just say I can understand the perspective of PC gamers more than I used to be able to, and my old PC gaming self is learning to make compromises between my console gaming self. I still find the term of the "Glorious PC Gaming Master Race" a tad... "snobbish", as it were, but I do respect for their general views and the fact that PC gaming is quite versatile; even though it does require a decent cash deposit to get things working optimally. But, once you do, purchasing the software needed to make use of that, is a joke!